How many of us in our twenties, thirties, and beyond can still fit into clothing from high school? With kids, careers, aging, and the ups and downs of life to contend with, I’m betting there aren’t too many of you raising your hands. Some of us have put on a few pounds or noticed our weight shifting around our bodies. Others have embraced fitness and sculpted their bodies in a variety of ways. The point is, our bodies were designed to change, and while it’s easy to view the bodies of our youth with rose-colored glasses, I, for one, do not miss the awkwardness of growth spurts, acne, and braces. I feel more confident and beautiful today than I did in my teens, despite being significantly heavier today. Okay, so here’s the cold, hard truth. Your clothes aren’t always going to fit. Guess what, though? There’s an entire world of sizes waiting for you, and that includes corsetry. You can always upgrade and make a new friend that is better suited to your currents station (and stature). You might feel some attachment to favorite corsets that have been with you through thick and thin (so to speak) for years, so you’ll be happy to hear that some alterations are possible. 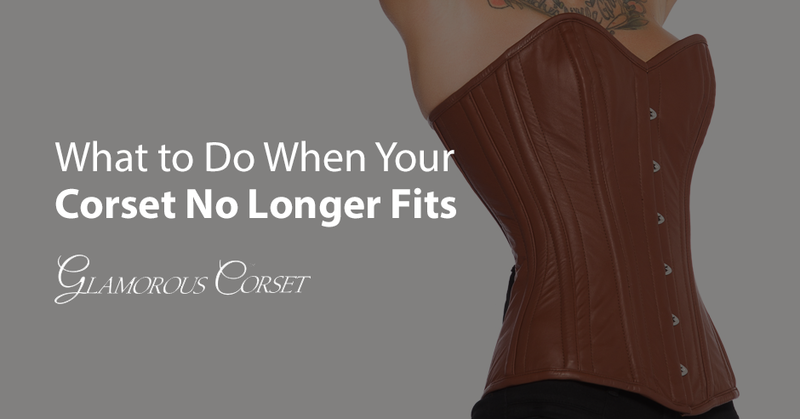 Here are a few potential fixes for when your corset doesn’t fit like it used to. One of the most common issues with corsets is modesty panels that are difficult to arrange. If they’re coming loose, bunching up, or otherwise interfering with your perfect fit, you can always remove them. In most cases, this is as simple as taking a seam ripper to the panel to easily remove it without damaging the larger garment. If your cinnamon buns tend to go right to, well, your buns (i.e. you add weight on the lower half), you may notice that longer corsets start to get a bit too snug in the hip area. This is a relatively easy alteration. All you have to do is add hip ties to accommodate your curves. As a caution, this solution only works well with corsets that have sandwich construction for added strength. For other construction, goring is a better choice. While it is technically possible to add ties to the top of your corset to account for too-tight rib or bust areas, do you really want the added bulk and chafe potential of ties under the armpits? Probably not, which is why goring is recommended for this alteration. Certain sizing issues could be more trouble than they’re worth. If your corset is too long or short or the spring is too severe for your body, doing alterations could be cost-prohibitive. In other words, it could require too much time and money to fix. These are cases in which you should seriously consider an upgrade instead of alterations. The goal of waist training is to slim your waistline. If you’re extremely successful, however, you’re going to size yourself right out of your favorite corsets. This is to be expected with any long-term waist training plan, and at some point, you’ll simply have to downsize. Of course, there’s also the possibility that you could gain some weight during the course of waist training. Hey, it happens! Many people face weight fluctuations throughout their lives for one reason or another, the most common being simple aging. There’s absolutely no reason to get upset and abuse your trusty corset. Simply box it neatly for possible later use and size up to a corset that is perfect for your current curves. Love the skin you’re in, remember that you’re beautiful at any size, and wear a corset that fits so you always look and feel your best! What Happens if I Don’t Season/Break In My Corset?